We confront challenges to our self-control every day. For those of us in the fields of science and medicine, the intense and fast-paced nature of our work only heightens the magnitude of these challenges. Do you leave early for happy hour or push through to finish setting up that last qPCR run? Do you break down and reach for a third cookie at the weekly speaker event? How many times a day do you click over to Facebook when you know there is paperwork to finish and emails still awaiting replies? Procrastination nearly always makes us feel more stressed, yet we’re all guilty of reverting to avoidance when the workload becomes overwhelming. We make these choices regularly, and we tend to assume that we consider each challenge independently. But what if each decision impacted the other, seemingly unrelated ones? I recently read the book Willpower: Rediscovering the Greatest Human Strength, in which the authors, John Tierney and Roy Baumeister, posit a novel way of defining, as well as harnessing, our self-control. Supported by extensive research in behavioral psychology, the authors explain that each individual’s willpower is best compared to a single muscle used repeatedly by all manner of decisions in our lives. They go on to explain that just as a muscle fatigues from repeated use, so does our willpower. When we rely on self-control, our subsequent decisions are affected as well. A compelling example of this phenomena is demonstrated in a study showing that participants who were asked to exert self-control and abstain from eating a doughnut at breakfast became distracted significantly faster during an unrelated, challenging task one hour later, compared to participants who were offered breakfast with no choices. 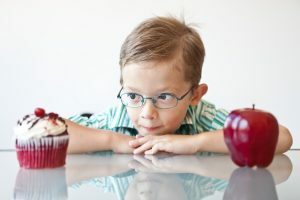 The authors go on to detail a number of other fascinating experiments that demonstrate the interconnectedness of our willpower usage. The most useful sections are those that draw on these experiments to offer readers tips for improving their self-control. Have you ever wondered why you forget the many items on your New Year’s resolution list by Feb. 1? According to Tierney and Baumeister, we draw our willpower for different tasks from the same reserve; therefore, it’s much harder to work on achieving multiple goals simultaneously than it is to focus on making one small change at a time. They suggest that by tracking a single change using a daily calendar to actively monitor progress, one can expect demonstrably more success in maintaining that change moving forward. 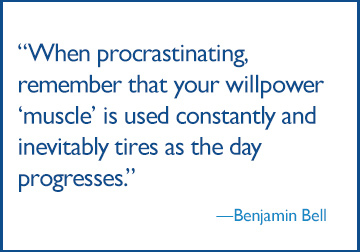 When procrastinating, remember that you use your willpower “muscle” constantly, and it inevitably tires as the day progresses. Therefore, it’s best to focus on finishing one step of whichever task you are avoiding early in the day, and the reward of crossing it off your list will make it easier to begin the next step. Ultimately, this means our willpower is challenged every day by innumerable small choices and tasks, even ones we fail to recognize, such as taking the stairs or responding to an email we’ve been avoiding. The result is that the additive effects of repeated minor exertions draw from our “reserve” and can often surreptitiously make bigger challenges appear insurmountable. Some days, this can be disheartening and leave us questioning why we feel so out of control. But by better understanding how we utilize our willpower, we can take back control and work with our internal system to make small changes, one by one, enabling us to better optimize our daily lives. Anxiety and depression have been thought to contribute to gastro conditions like irritable bowel syndrome (IBS). A Johns Hopkins expert explains how what’s going on in your gut could be affecting your brain.